I was not familiar with the myth prior to reading Roberts' interpretation, and I think that it stands well on its own. We are quickly, and rather brutally, introduced to the deprivations of the King, Gilgamesh, and the cloud that hangs over the citizens of his city. He is both their protector and their destroyer. 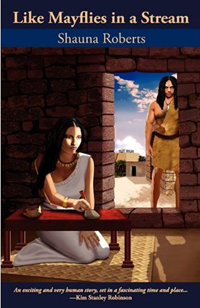 Also in play are Shamhat, a priestess of Inanna, who has personal connections to both the King and the newly-forming rebellion; Zaidu, a trapper who sets the story in motion; and Enkidu, beast-man raised by gazelles, who becomes the fulcrum of change. The King is a bull of a man: muscular, quick-tempered, and driven by powerful lusts. He cripples the men he wrestles, races others beyond exhaustion, and now has claimed first "rights" to any bride. Gilgamesh answers to no one but the gods—and while the temple grows rich from offerings left by those begging the goddess Inanna for protection, the clergy are simply one more voice that the King ignores. When Zaidu comes to Gilgamesh with his tale of a beast-man destroying his traps, the King sees that perhaps he has found an equal to try. Gilgamesh sends Shamhat into the desert with Zaidu to tame the beast-man and bring him back to the city. The emotional and political twists and turns are best experienced firsthand. I recommend this novel for both its fast pacing and insightfulness, as well as for its historical grounding, and I look forward to more from Hadley Rille Books' Archaeology Series. The review copy was provided by the publishers and will be retained by our reviewer.